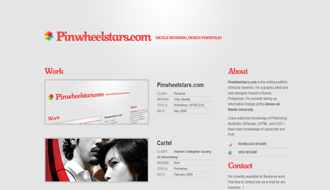 Pinwheelstars.com is the online portfolio of Nicole Severino. I’m a graphic artist and web designer based in Manila, Philippines. I’m currently taking up Information Design at the Ateneo de Manila University.